Disneyland’s Mad Tea Party attraction, commonly known as the Tea Cups, is not generally considered to be one of the park’s more terrifying rides. 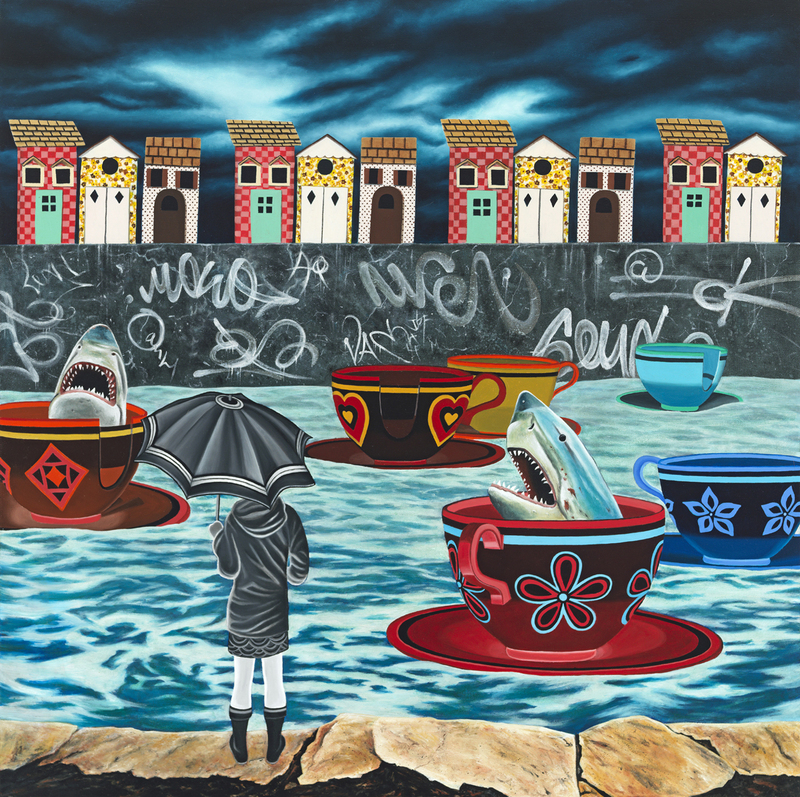 But…say there where menacing sharks lurking inside each brightly-painted, whirling cup — what then? Now that would be very scary! Fortunately, that is not the case, and the provocative image you see above is not from an actual news source, but rather it is a surrealist painting by Chicago-based artist Nicole Gordon, entitled Low Tide. I quite like it. If you feel similarly, perhaps you would like to know that on Saturday, July 15th, 2017, the Corey Helford Gallery in Los Angeles will host an opening reception for its exhibit of new works by Gordon, in her first solo exhibition with the gallery, entitled Dehydrated Rainbow. Here’s a bit more information in case you maybe want to check it out. Nicole Gordon’s paintings lean on the whimsical and somewhat grim, an expression of beauty met with the horrors of real world change and transformation. The artist describes her work as a combination of fantasy with darker truths: her use of bright colors and out of place objects create an imaginative view of reality. For Dehydrated Rainbow, Gordon selects amusement parks and rides (many of which are now abandoned), meshed with pop-culture iconography as her subjects. The exhibition features 15 new oil paintings and a special, interactive installation inspired by the series. Populated with ghost-like children, these dramatic, vibrant landscapes draw from our innocent childhood experiences and something more sinister. Children are painted in black-and-white to suggest this world is a dreamscape, rather than reality. One element that repeats throughout is a Tea Cup, as you see in the painting above. Gordon explains, “The spinning tea cup ride is something so joyful and so innocent, but also so terrifying and sickening. I think it is something most people can relate to visually. The ride is often simultaneously exhilarating and terrifying, not unlike the experience of looking inwardly and relying on ourselves for a deeper understanding and connection with the world around us.” And of course, it ismuch worse if sharks are involved. Dehydrated Rainbow By Nicole Gordon will be on exhibit from July 15th to August 12th, 2017, at Corey Helford Gallery, Located at 571 S. Anderson St. (Enter on Willow St), Los Angeles, CA 90033. The opening reception on Saturday, July 15th runs from 6:00 -11:00 PM, and it is open to the public.